Thank you for your interest in licensing Back to Eden Film for a public screening. The license is for one-time use (if you are interested in multiple screenings, please note that in your correspondence with us in the ‘additional information’ section below). With the purchase of the public screening rights license, you may screen the film in a public setting and charge admission if you so choose. Theatrical, broadcast and digital distribution is not covered by this license. Please fill out the following questionnaire so we can determine the screening rights fee for your organization/event. Please give as much information as you have at this time. If you do not have all the information, please just leave the field blank or mark 'to be determined'. You will hear back from us in 24-48 hours. Below is a Screening Kit to help your promote your screening. Please view the screening calendar to find upcoming screenings of Back to Eden and events near you. Don’t see a screening in your location? Register a screening your hometown! Please check back for updates on future events or subscribe to receive notification of Back to Eden news and upcoming events! In 2010, Mark McOmber and his family implemented the Back to Eden gardening methods. Their organic gardens in Gettysburg, PA are featured in Back to Eden Film and have been toured by individuals throughout the United States. Currently, Mark is the Director of Back to Eden Community Organic Garden in Gettysburg, PA. Mark has represented Back to Eden Film at Joseph International's Places of Refuge International Conference in Kansas City, KS. Additionally, he has assisted many individuals and families install these self sustaining organic gardens. Learn from his experiences, trials and errors by inviting Mark to speak at your event! Starting in August 2010, Dana and Sarah spent 10 months filming and interning with Paul Gautschi. In addition to Producing and Directing Back to Eden Film, they tasted, explored and walked with Paul Gautschi in his orchards and gardens daily. This experience equipped Dana and Sarah to teach Paul's Back to Eden growing techniques to beginner and master gardeners and farmers. Since 2010, they have implemented several Back to Eden gardens that they enjoy reaping the abundant harvests. 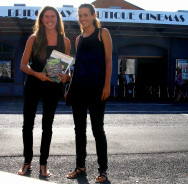 Dana and Sarah have toured with Back to Eden Film nationally and internationally, offering Q & A sessions and digital presentations following each film screening. Their presentations include interactive demonstrations, stunning visuals, and valuable gardening resources. Learn from the filmmakers by inviting Dana and Sarah to speak at your event!